Patients are hurting because of healthcare they cannot afford or access, or by healthcare services that have failed them. Providers are hurting because they can’t afford to keep their practices open with dwindling insurance reimbursements. We are all hurting from having to rustle patients through or being rustled through as patients. In the healthcare industry this is called a “cattle car” mentality, where you are required to see a certain number of patients per hour (usually too many to be truly effective at your job or at your own self-care). Americans are sick and tired of being sick and tired. basic care they need to survive. care for cancer and degenerative diseases. And of paying more for their healthcare than everyone else in the world, and yet having the worst outcomes of any other healthcare system in the world. To add insult to injury, America’s healthcare providers have the highest suicide rate of any other profession. This is no mistake. What we are doing in healthcare is not sustainable, and it is breaking all of our backs (and minds and bodies). Americans are hurting because we do not have healthcare in America. We have sick care. And that sick care is not even providing the basics to you, the citizen who pays dearly to have insurance. Until we have healthcare in America, our providers and their patients will have to deal with the shameful fallout. American mothers and children will continue to die at higher rates than any other developed Nation in the world. And young men and boys will continue to suffer at the hands of violent action because mental health is unavailable and horribly stigmatized. The American healthcare system is sick, and sickening to our society, and it must change. There is a tide of positivity, however. And it is working. Yoga is well supported as a way to stem the tide of illness and disease and impairment in America. Yoga is an effective way to prevent injuries and illness and to promote whole body wellness. It is a complete system of complementary care that can be responsible for neuroplasticity in a way that profoundly heals, at a biological and psychological level. While all yoga can be beneficial, not all yoga is created equal. The way it is delivered should be scrutinized. If yoga is important and possesses power to heal and transform as it claims, then it should be well scrutinized. Let’s start with basic yoga labels. There is yoga. There is yoga therapy. And then there is yoga in healthcare. The three are very different, and are not comparable. But they can be complementary to one another. Ginger Garner has scrutinized the practice of yoga with 381 pages of evidence-based conclusions to consider in her text, Medical Therapeutic Yoga. Medical Therapeutic Yoga is a method for delivering yoga in healthcare in a holistic way. While some may be tempted to equate healthcare with medicine, or yoga or yoga therapy with yoga in healthcare, they are not the same. Yoga in healthcare means something different than yoga or yoga therapy or yoga in medicine. Medicine is encased in a biomedical model that historically only addresses a person’s health after they are sick. Yoga in medicine then, would imply that yoga is applicable for yoga in sickness. But yoga in healthcare means more and does more. Yoga in healthcare addresses prevention as well as cure. Yoga is also effective when delivered by yoga teachers and therapists. However it should be noted that both are suffering significant growing pains right now, carving out their own definition, professional boundaries, and legal status. This is why the distinction of yoga and yoga therapy from yoga in healthcare is so important. Yoga teachers are a wonderful and beneficial resource to deliver yoga to healthy populations. And, with additional training, they can also address populations with impairments. However, they are not a substitute for licensed healthcare providers and cannot evaluate, diagnose, prescribe, or treat. The same is true with those who use yoga therapeutically. Yoga teachers and therapists are not allowed to evaluate, diagnose, or treat individuals with impairment and are not licensed healthcare providers. Within healthy boundaries, yoga teachers and therapists can be valuable members of the continuum of care for fitness and wellness. But let’s get back to the topic of yoga in healthcare, the focus of this foundational course. If you want to use yoga in healthcare, this course teaches you how to do it safely, efficiently, and effectively while lowering your overhead, addressing or preventing practitioner burnout, and improving patient outcomes and your own self-care. Ginger has over 25 years of experience in the study and practice of yoga, and over 20 years of experience in patient care. Yoga in healthcare is a specific practice in the field of medicine. Yoga in healthcare is practiced by a licensed healthcare provider who has had post-professional or graduate-level training in yoga that has been evolved according to science and our current best practice evidence-base. Those who use yoga in healthcare as a licensed provider are able to evaluate, diagnosis, and prescribe treatment that will affect the human condition across the lifespan, which includes streamlining the use of yoga into their medical or rehabilitation practice. Ginger’s text, Medical Therapeutic Yoga, now in its 4th foreign translations, offers a definitive guide to help a practitioner at any level hone their yoga skillset inside the healthcare system. Come and study Medical Therapeutic Yoga as an effective, proven, evidence-based method of yoga that can be used in healthcare and wellness care, especially in rehabilitation fields like physical therapy, occupational therapy, and athletic training and bedside caregiving fields like nursing. 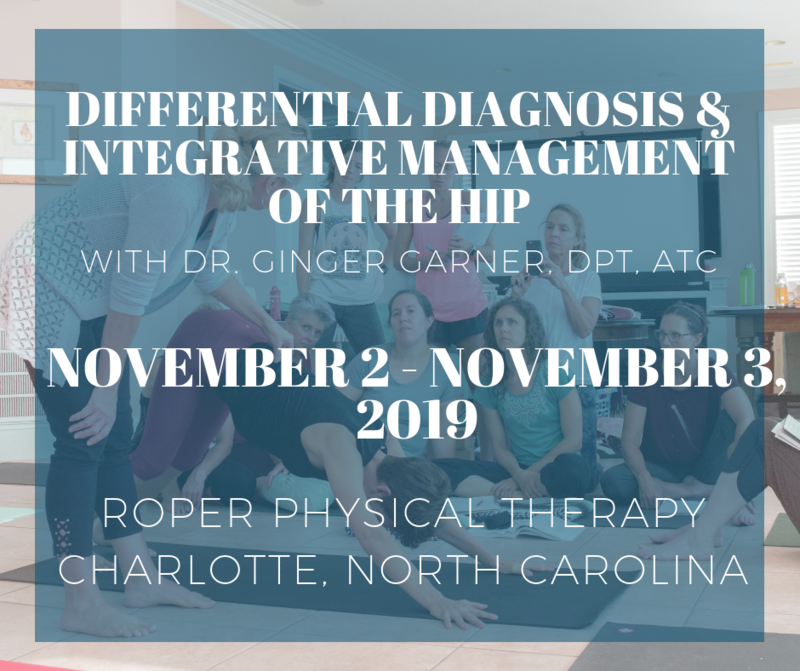 This course will enable you with a skillset to begin utilizing an integrated practice model, which includes the study of Functional and Integrative Medicine through the lens of yoga. Looking for some “cliff notes” for Ginger’s textbook? They are available at www.medicaltherapeuticyoga.com. Practice for free (a little karma yoga gift) and also read her Preface and Chapter 1 as well (2 gifts for 1!) and get to know how yoga and faith saved Ginger’s life, helping her escape injury and domestic violence and abuse. Helping her rise above the label of “victim” to victor. None. Although a basic level of knowledge about yoga can be helpful, it is not necessary. Verbalize the history of yoga & healthcare to understand its evolution into clinical practice. List guidelines for integrative practice. Discuss methodology for using yoga in healthcare. Identify posture and breath techniques that can be used to affect kinesthetic impairment and pain management. Practice unique diaphragmatic breathing patterns to improve safety and efficacy of yoga prescription. Discuss case studies in a lab format. Demonstrate applicability of MTY precepts in your healthcare practice. Apply yogic and behavioral change theory in your daily life and practice.